With the movie Cinderella in theaters, I thought it was a good time to take a look at the beautiful piece of art on display inside Cinderella castle at the Magic Kingdom. 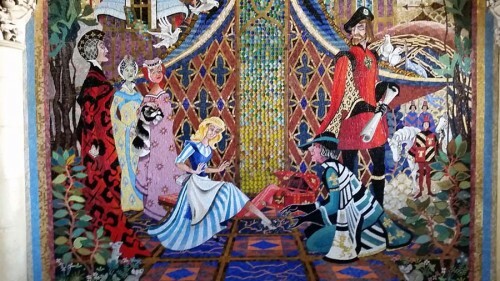 The main corridor between Fantasyland and the Plaza is home to an amazing tableau retelling of the classic fairy tale “Cinderella” in five massive mosaic murals. Designed by Disney Imagineer Dorothea Redmond and assembled by artist Hanns-Joachim Scharff and his team of six craftsmen, each mosaic mural was hand cut and applied. There are over 300,000 pieces of Italian glass in more than 500 colors along with ‘gems’ and bits of gold and silver in the murals. Some of the murals are as large as fifteen feet high and ten feet wide. The whole project took nearly two years to complete. There’s also a bit of hidden Disney in the mural. In the scene after the ball where Cinderella is trying on the slipper, the footman was made to resemble Herb Ryman and the Arch Duke looks like John Hench. Both men started as animators and later were key to creating the look and feel of Walt’s prized theme parks. A gallery with 18 more images and close ups from the murals are below the jump.